Those who have been jailbreaking for some time will always remember a select few jailbreak tweaks. One of these tweaks is Color Keyboard which allows you to customize the iOS keyboard to your hearts content. 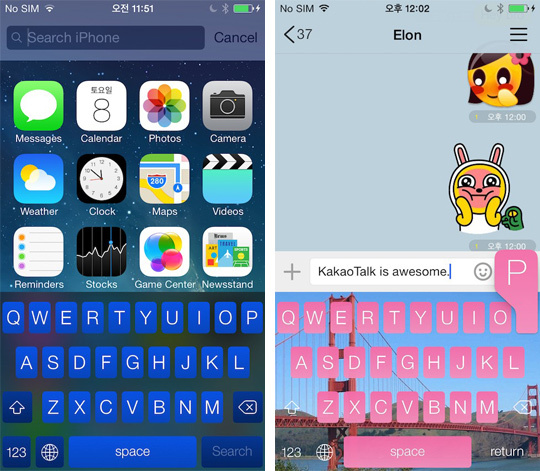 Fans of Color Keyboard will be glad to know that it has been updated to support iOS 7. Unlike Fancy, which was the only way to customize the color of your keyboard until now, Color Keyboard comes with multiple keyboard themes (not just colors) to choose from that come with the tweak. Even more can be downloaded from Cydia and you can even make your own. After installing Color Keyboard you will simply need to enable it in the Settings App and then tap on “Select Theme” to choose your theme. A respring will be required to implemented each theme, but luckily you also have a preview available. You can find Color Keyboard in Cydia’s BigBoss repo for $0.99. 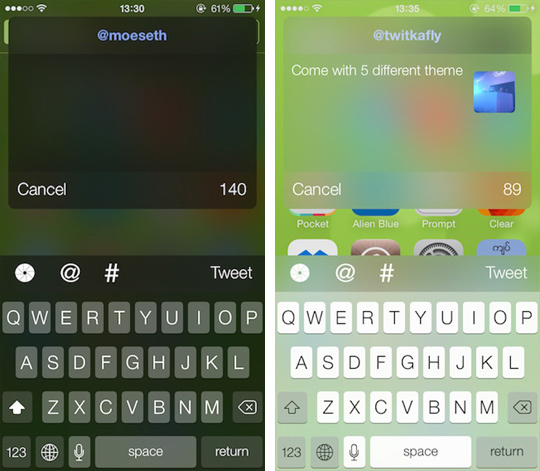 TwitkaFly is another popular tweak which has been updated for support on iOS 7 and if you’re a heavy Twitter user then you’re going to love this tweak. What the tweak allows you to do is quick reply and quick compose tweets from various areas of iOS like the Notification Center… You can even install the FlipSwitch tweak for Control Center to add them into the Control Center toggles section. There is of course also integration with Activator as well. There’s currently 5 different themes available for TwitkaFly, with most people’s favourite being the Dark theme. TwitkaFly also comes with a few other options like the ability to customize the quickly reply icon, changing various sounds and much more. Note: As TwitkaFly is extending the functionality of the official Twitter app you will need to thus have the official Twitter app installed from the App Store. Additionally you will also have to enable Push Notifications for the official Twitter app. You can find TwitkaFly in the BigBoss repo for $3.99, it also comes with a free trial so you can give it a whirl before paying for it. Same … What’s the deal ? Ok, I have been installing and uninstalling the package for Color Keyboard ios 7. It will not work no matter what I do. Can the dev please check out what the heck is going on because I want to be able to use it! On the plus side, thankfully it’s only 0.99 or else I’d be super pissed. I think you should go to settings-general-keyboard- add new keyboard (or whatever it says) find it. Hope will work I didn’t try.